At the Killing Fields, Phnom Penh, today, an unanticipated heavy weight of sadness has draped itself over my shoulders and lodged in my chest. This is ‘Choeung Ek Genocidal Centre,’ Cambodia on the outskirts of Phnom Penh where the reality of man’s inhumanity to fellow man is conveyed in harrowing detail. 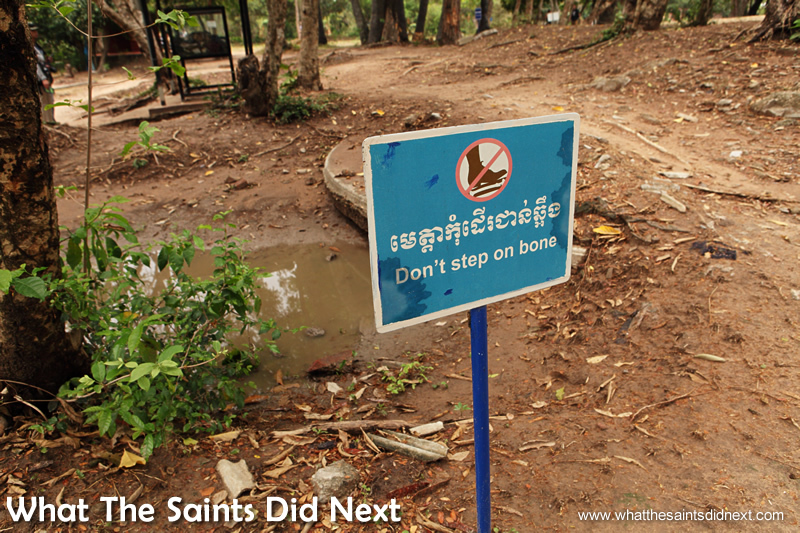 As one of the world’s most infamous dark tourism destinations, the Killing Fields of Cambodia represents one of these all too frequent periods in world history. This one occurred between 1975-1979; in my lifetime. During these four years of civil war horror, an estimated 1.7 million people were massacred. This place of incredible tragedy has today been sensitively converted into a peaceful visitors’ centre and the disturbing story is retold; we are walking across the very ground where nearly 20,000 Cambodians were murdered. Even today, more than 35 years on, following periods of heavy rain, fragments of clothing and bones from victims will surface through the mud. 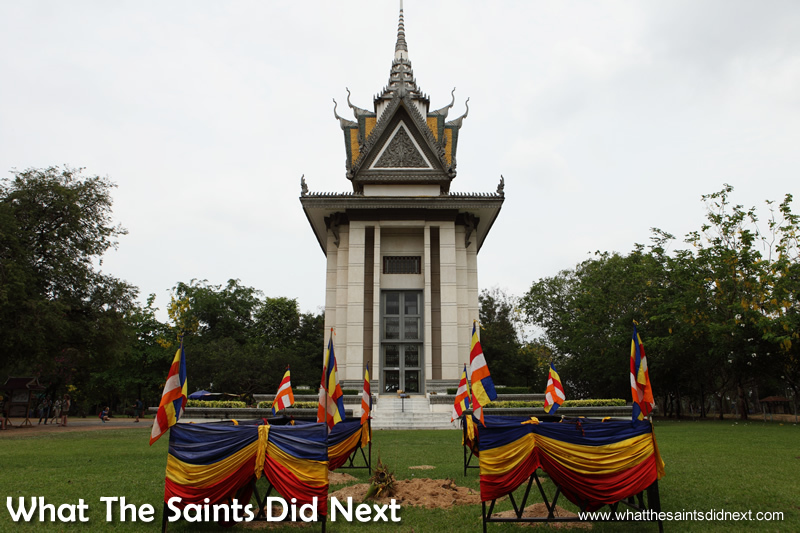 The Killing Fields movie, a 1984 British made film, brought a degree of awareness to what happened here. However, for many people around the world the extent of the true horror is only vaguely understood. It saddens me to say that included me before now. 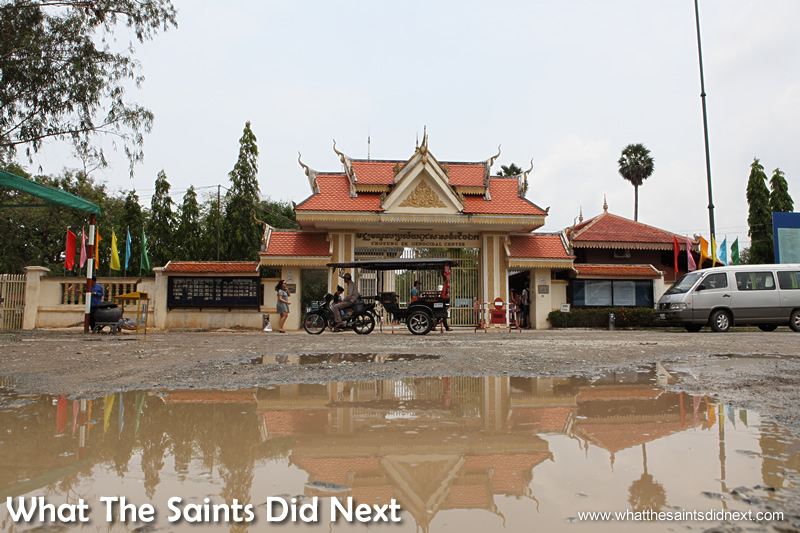 I entered the main gate at Choeung Ek with no expectations and my limited knowledge of what it represented. 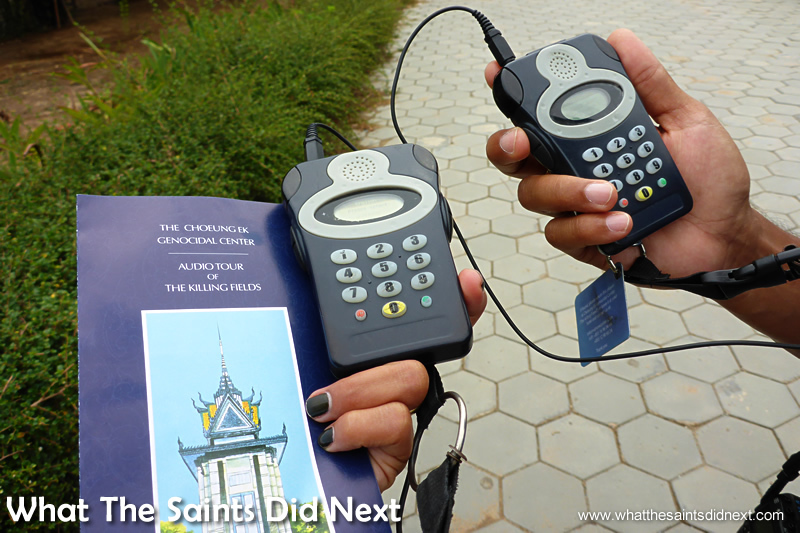 The audio guides provided at the gate are a must; they enhance your understanding of the memorial. The audio guide is free, no deposit required. It contains 18 audio stories, supplemented by additional, optional information and survivors’ stories. Pausing, rewinding or skipping between different chapters is simple. 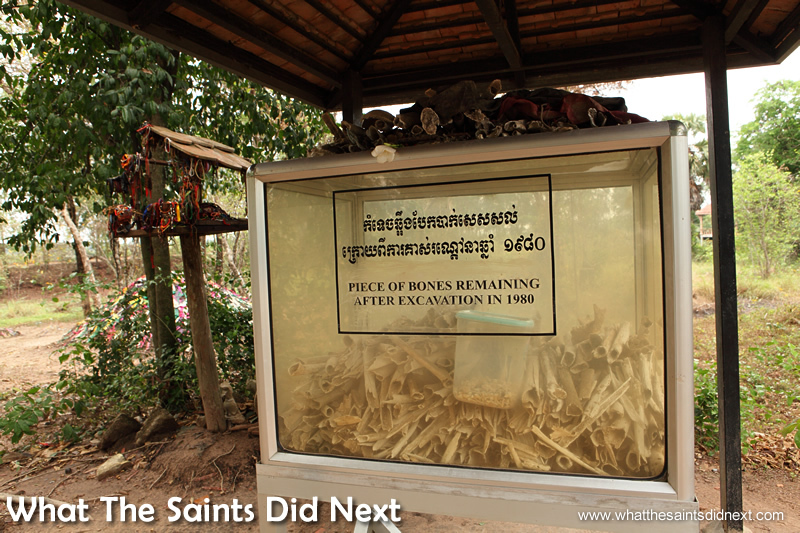 This display case at the Killing Fields of Cambodia shows some of the human bones that have been collected since 1980. “To dig up grass one must remove even the roots.” Khmer Rouge slogan referring to the killing of children. Allow an hour and a half, even two, (at least) for a meaningful visit. The imposing Stupa dominates the grounds upon entering, but the audio guide directs you away, explaining the tall building will be the last stop. The area is about six acres. It’s very peaceful with “keep quiet” signs at regular intervals. 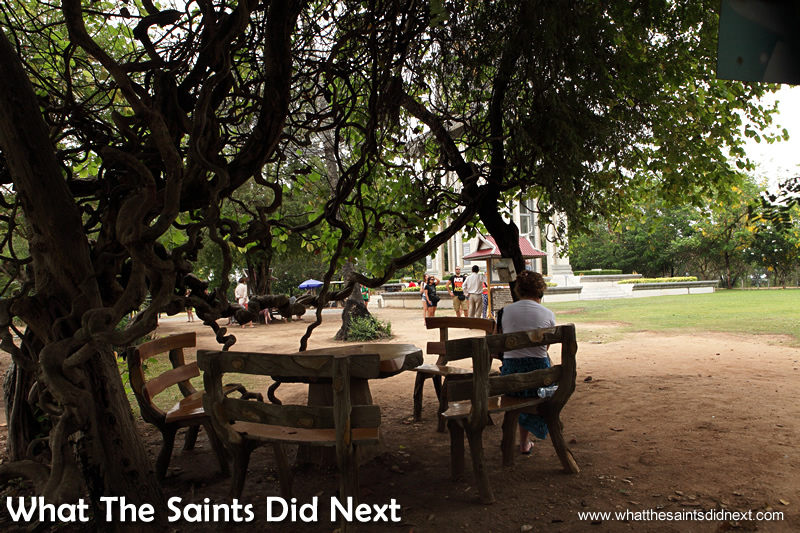 Visitors are encouraged to sit on the benches and stools and under trees to listen to certain parts of the commentary. 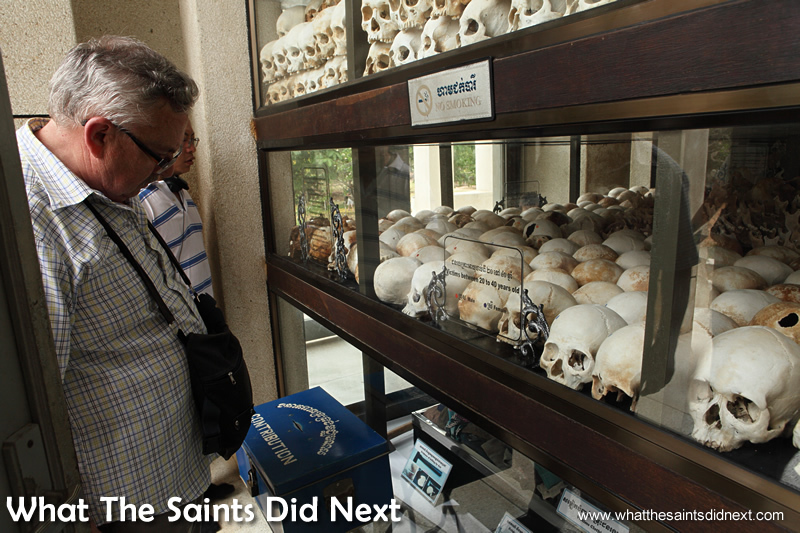 The first thing you learn on the tour is there wasn’t just one killing field in Cambodia, but many; hundreds in fact. They refer to the genocide that took place under the Khmer Rouge era, 1975-79, when leader Pol Pot ordered the killing of thousands of Cambodians who he perceived to be a threat to his regime. Friendship bracelets cover the base of this tree. The sign reads: “Killing tree against which executioners beat children.” Children’s skulls were smashed against the tree, their bodies then thrown into the grave. 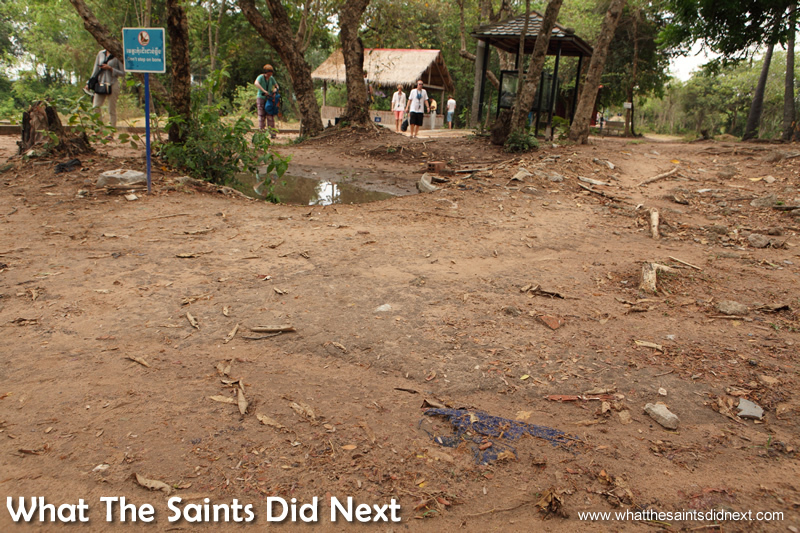 Choeung Ek Genocidal Centre – The Killing Fields of Cambodia. The signs are sobering. 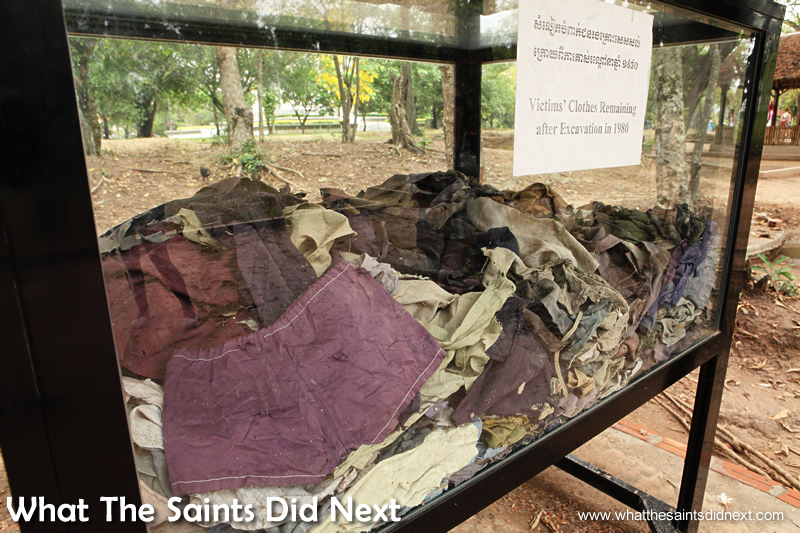 Rags of Victims’ Clothes – After the mass graves were exhumed in 1980, these rags of victims’ clothes surfaced after periods of rain. They were collected and placed in this display box. Many are clearly children’s clothes. 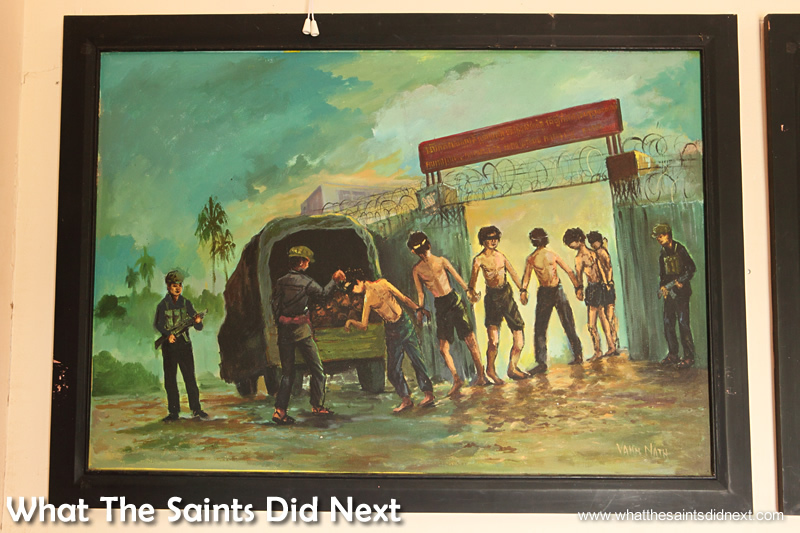 The Choeung Ek memorial contains 129 mass graves. The visitors today were mostly all foreigners; all respectful and sombre as we walked slowly around the grounds. 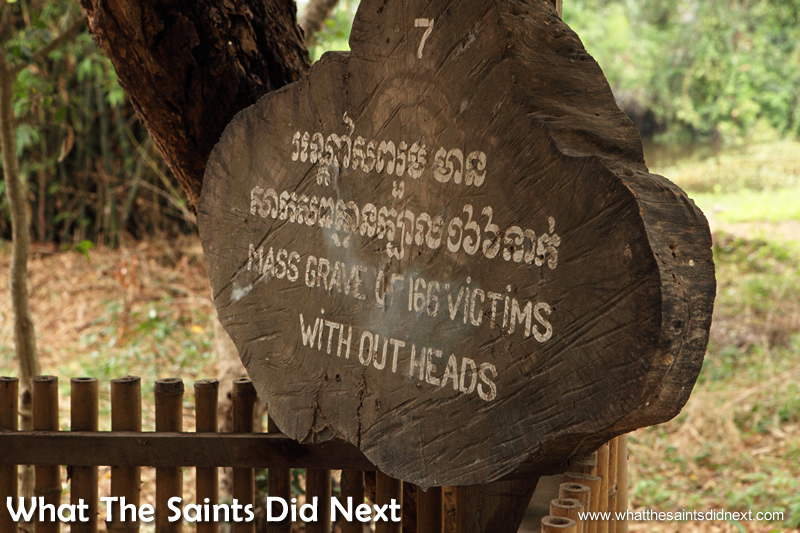 The mass grave which had given up 166 headless bodies was very powerful. I measured the size of the grave at approximately 6m x 4m. In this tiny space 166 headless bodies were found. 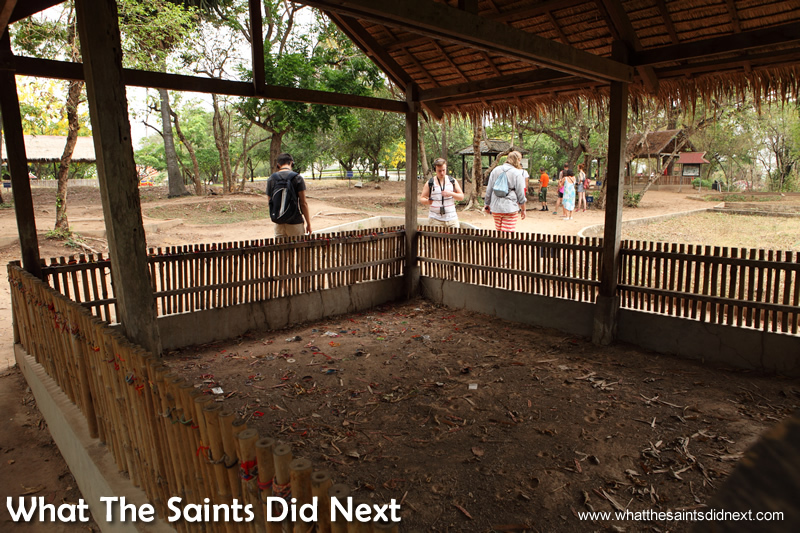 Choeung Ek Genocidal Centre – The Killing Fields of Cambodia. The sign on the grave. 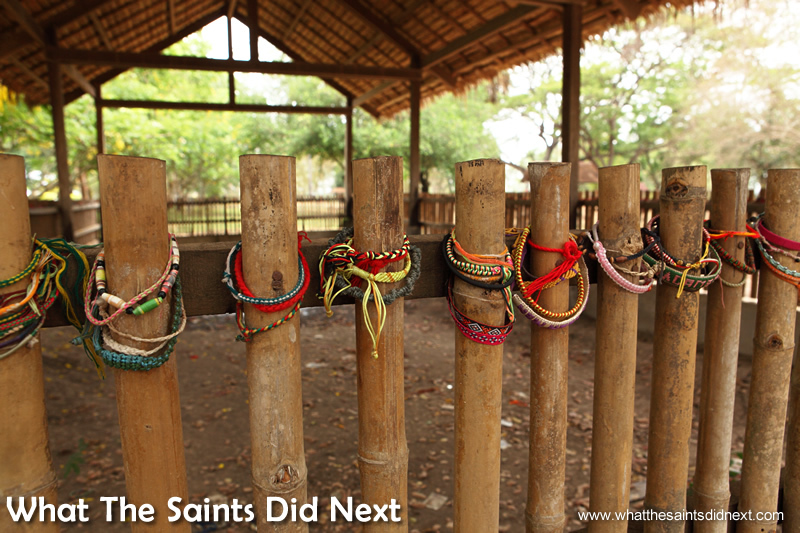 Visitors have left friendship bracelets on the bamboo fence. One of the listening points on the tour route. Looking up at the Stupa at the end of the tour the sight of rows and rows of human skulls encased in the glass tower, brought home the enormity of what had happened. People; innocent, beautiful people were senselessly shot, hacked, bludgeoned, stabbed and beaten to death. These people, young and old, never stood a chance; their fate predetermined by their place and date of birth. I am of that era, but unlike the thousands who were slaughtered, I exist today by the simple fortune of geography, being born on St Helena. It means I get to experience a world where I am privileged to write my own story. Inside the Stupa visitors come face to face with the skull remains. 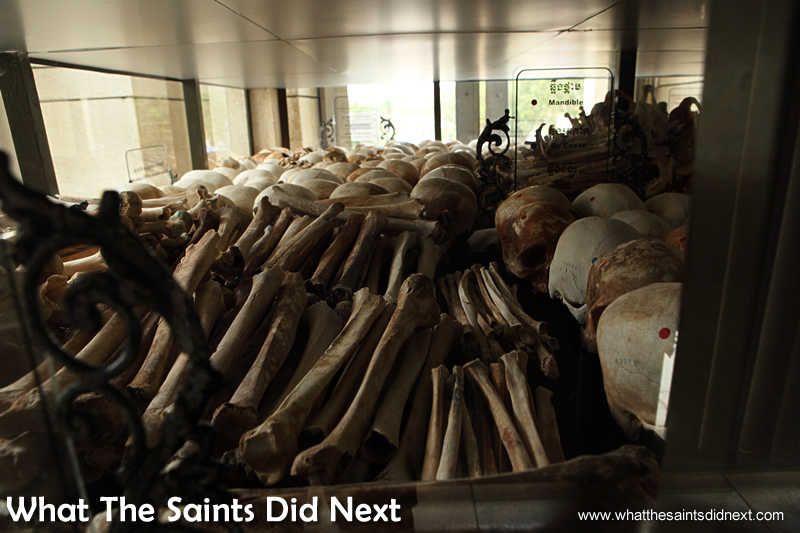 Human bones that have been collected, displayed inside the Stupa at the Choeung Ek Genocidal Centre – The Killing Fields of Cambodia. The Stupa which contains the human bones in a glass tower. There are 10 levels and 9000 victims. Choeung Ek Genocidal Centre – The Killing Fields of Cambodia. Cambodia has been educational and humbling. I will leave with a greater appreciation of my own life and the opportunities and choices that have been my own. The sense of sadness I’ve seen in the faces on the streets of Phnom Penh may just be my imagination, but at risk of generalising, my visit today suggests perhaps not. 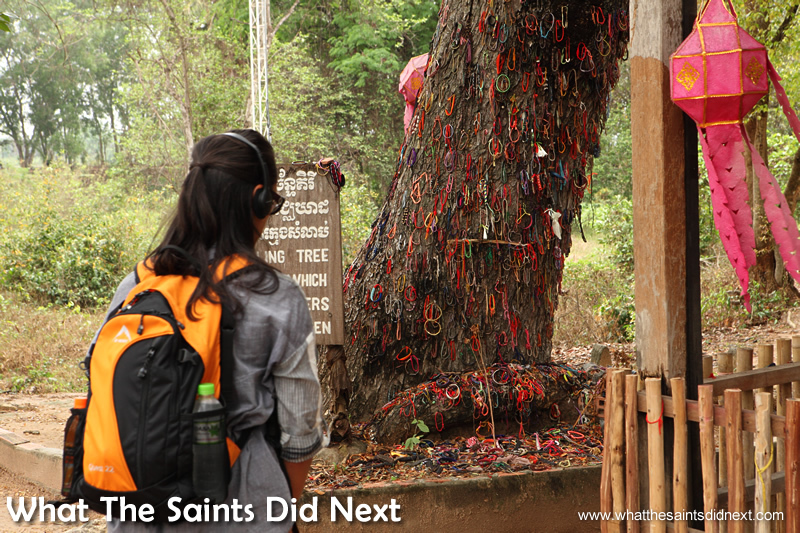 The Killing Fields of Cambodia at Choeung Ek is a powerful and moving and emotional experience. A painting in the museum. A truly moving account. Always enjoy reading about your adventures but this is the first time I’ve been prompted to comment – like you the story of the Killing Fields existed on the edge of my subconscious – you’ve brought it to the forefront – your words will certainly stay with me for some time to come. Thanks Maria, lovely comment. 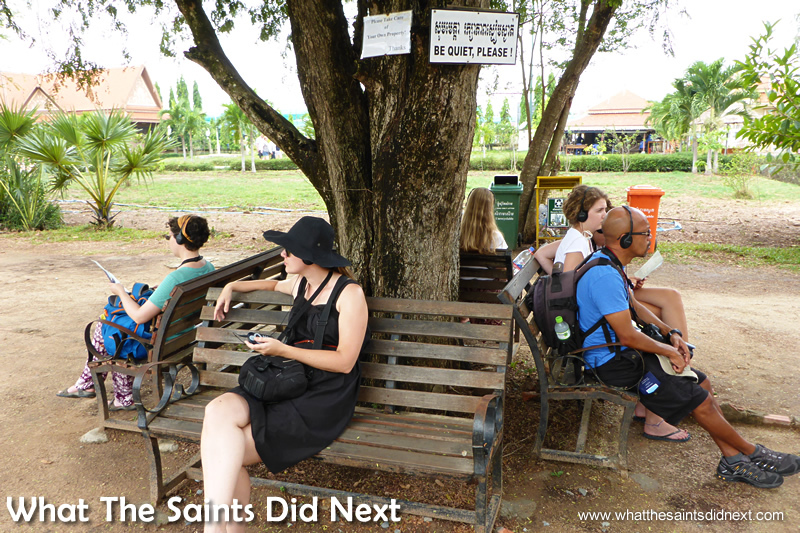 The Killing Fields had a profound effect on us, I don’t think I’ll ever forget the weight of sadness that hung over that place. 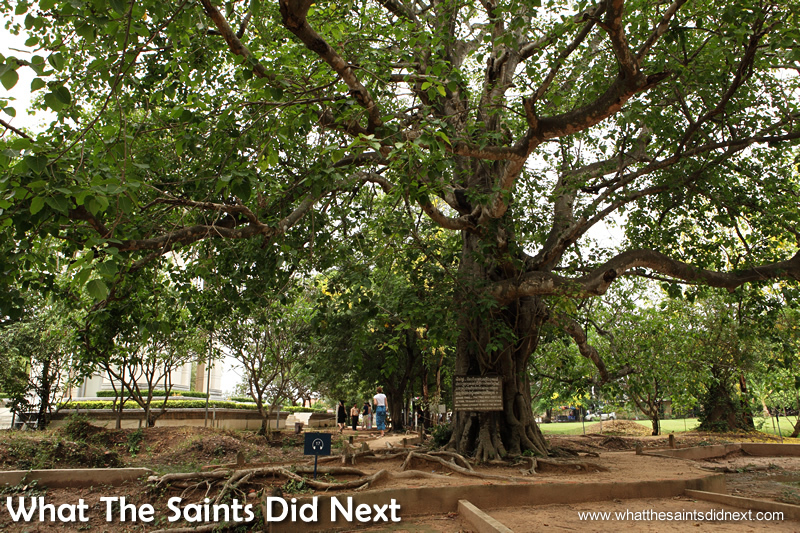 Many of us have so much to be thankful for and places like Choeung Ek are important to remind us of that. Sobering account and visit. Puts the negativity that sometimes encompasses our own lives and reality into some stark perspective. 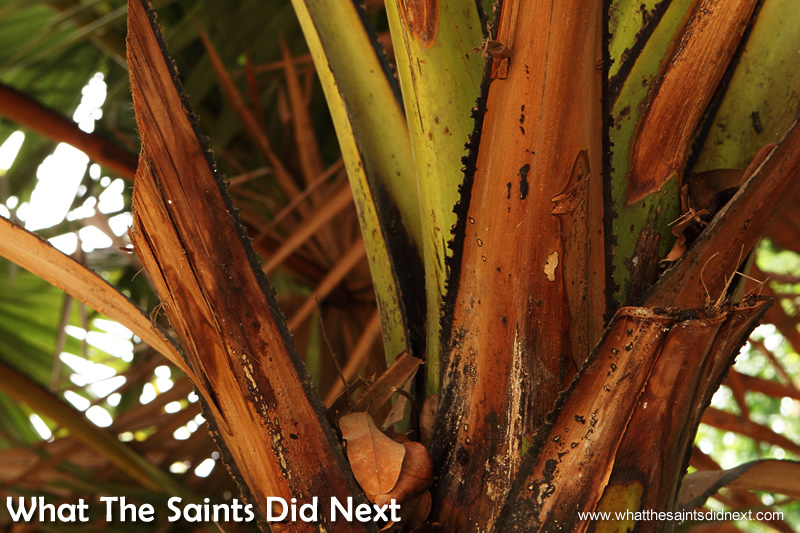 What truly fortunate people we and all on Saint Helena really are. Thanks Paul. Yes, are problems pale in comparison. St Helena was foremost in my thoughts walking around this place as I appreciated even more how blessed we were to grow up there. Check out Loung Ung’s book ‘first they killed my father’. It is a fantastic account of a terrible period. Your blog was fascinating. Thanks for the recommendation Faye, I will get this on the Kindle. Appreciate your kind comment, thanks. I always enjoy your uplifting and fun accounts of your adventures but I have to say this is by far one I enjoyed reading the most…not because of the circumstances, of course…but because of the truly humbling feeling you have excellently portrayed. It is sobering to so many of us who moan constantly about everything when our situations are petty by comparison. Thanks Kylie, we always appreciate your support and comments. This place certainly does put our own problems into perspective. The sensitivity with which the memorial has been designed makes it a very effective educational experience – and humbling. It is heart breaking to see this story up close and I agree with your thoughts completely: “how can we do this to each other?” Sadly it seems not enough people in the world have learned from these things. Thank you for your very moving account . Every now & then we experience horrors that demonstrate the need to keep our guards up because the inhumane behaviours used by Khmer Rouge still walk the world. Looking forward to the account of your next adventure. Thanks Roger, yes it’s all too easy to become complacent and forgot these horrors. We all have to play our part in keeping our guard up. What a wonderful but disturbing story of all those people including children who didn’t had a choice in life, thinking back what I was doing around that time and how privileged I were when killings and executioners beat children to death. Sad….. Always amazing stories and photo’s. Thanks Borbs, I agree with you, sad indeed. We have been very privileged.